This activity and award is recommended for Boy Scouts and Venturers ages 11 to 17; Cub Scouts are probably too young for this discussion. This award is designed to complement existing Boy Scouting and Venturing programming. This award’s training curriculum consists of four lessons that could be reviewed at the start of a unit meeting, taking no more than 12 to 15 minutes each. The program is self-paced, which allows the unit leader to determine how quickly it is completed. Have your unit review each of the four lessons in this curriculum. Go to the resources section on this page and download the PDF files for the leader manual and lessons. This curriculum has been prepared specifically for ages 11-17, and each lesson must be followed specifically as written. Where applicable, have all unit participants successfully complete the activity and/or supplemental exercises for the corresponding SCOUTStrong Be MedWise lesson. What will Scouts and Venturers learn? Understand what prescription and OTC medicines are, and the ways they are the same and different. Learn how to use medicines safely. Know what’s on the Drug Facts label. What about the patch and certificate? To download a certificate you can print, click here. 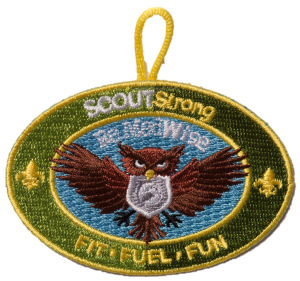 To order your SCOUTStrong Be MedWise patch, click here. Click on the links in the table below to download PDF files of the Leaders Guide, Lessons, and Exercises.